Mercury raised its muscle car profile with the introduction of the 1969 Mercury Cougar Eliminator. 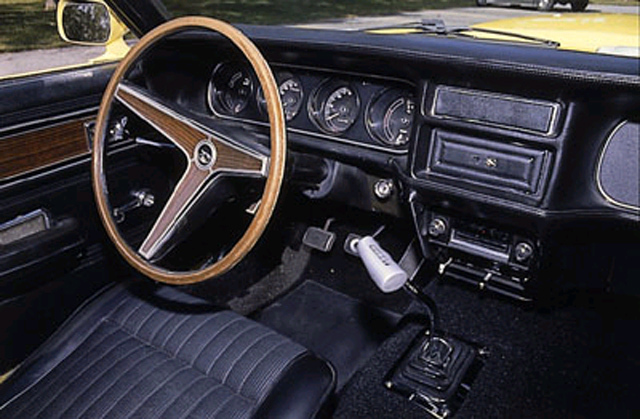 Taking its cue from such rivals as Z28 and SS Camaros, as well as Ford's own Boss 302 and Mach 1 Mustangs, Ford introduced the Eliminator in April 1969. The Eliminator came with a range of engines, from the Trans Am-inspired solid-lifter 302-cid small block to the 428-cid Cobra Jet big block. Mercury Cougar received its first restyle for 1969, and Mercury answered the Boss 302 and Mach 1 Mustangs with the striped-and-spoilered Eliminator. See more muscle car pictures. Mercury had introduced its sporty coupe in 1967 as a luxury-touring alternative to the pony-car herd. It had mature styling and upscale interior appointments and was built on a Mustang chassis stretched by three inches to provide a longer, ride-enhancing wheelbase. Mercury in these years was deeply involved in racing. It backed a variety of record-setting Comet and Cougar drag specials, as well as NASCAR-winning Cyclones. Its street image was tamer, though not for lack of trying. Cougar contributed with the '68 GT-E, which like the Mustang, opened the year with an available 390-horsepower 427-cid V-8, then switched to the 428 Cobra Jet. The image was still more Euro luxury touring car than American muscle, though. It wasn't until the release of the 1969 Mercury Cougar Eliminator that Mercury was able earn a reputation for muscular Detroit iron. Not all 1969 Mercury Cougar Eliminators were that powerful. In all-out acceleration, the available 290-horsepower 302 was overmatched by the Cougar's weight, but the 428 Cobra Jet benefited from the relatively generous wheelbase. Grip was slightly better off the line than in the shorter Mustang, and quarter-mile times were every bit as good. Like Mustang, the Eliminator offered the 428-cid CJ with and without Ram Air, as well as in Drag Pak guise with an oil cooler and a 4.30:1 gear-ratio Detroit Locker rear axle. The Eliminator didn't use the shaker hood; its standard scoop was functional only when Ram Air was ordered. A blacked-out grille, side stripe, and front and rear spoilers enhanced the muscular look, and Mercury offered the Eliminator in a palette of "high-impact" blue, orange, and yellow exterior colors. More impact could be obtained over dealer parts counters, which offered not only headers and dual-quad carburetors, but such exotic hop-up components as deep-sump oil pans and quadruple Weber carburetor setups. From the factory, or with these available parts, the 1969 Mercury Cougar Eliminator was true American muscle. attributes with an upscale European flair. The phrase Mercury muscle cars was no contradiction in terms; even this staid marquee had a quick-car lineup. See profiles, photos, and specifications of other Mercury muscle cars. The 1966 Ford Fairlane 427 could hold its own with any muscle car, but was simply outnumbered.